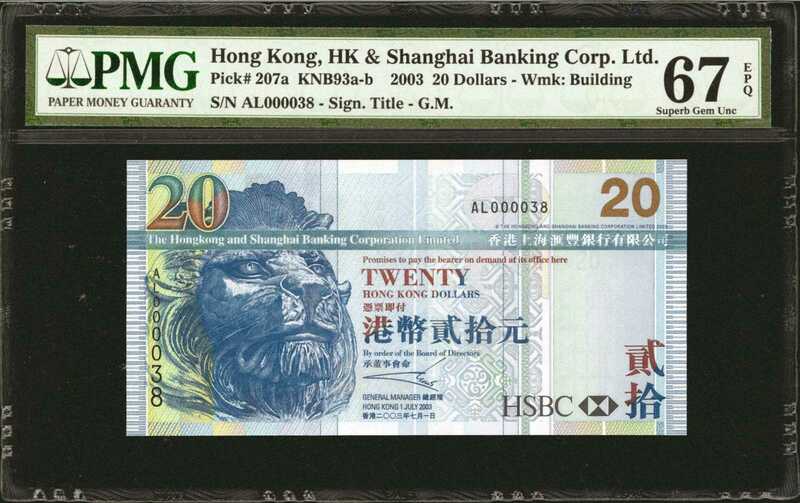 2003年香港上海汇丰银行贰拾圆。4枚一组，其中3枚款式分别为P-207a、208d、209c，分数均为PMG Superb Gem UNC 67 EPQ，序列号均为000038。另有P-215d分数为PCGS GSG 66 OPQ，序列号262626。PCGS GSG Gem Uncirculated 66 OPQ & PMG Superb Gem Uncirculated 67 EPQ.HONG KONG. Hong Kong & Shanghai Banking Corporation. 20, 50, 100, & 500 Dollars, 2003. P-207a, 208d, 209c & 215d. PCGS GSG Gem Uncirculated 66 OPQ & PMG Superb Gem Uncirculated 67 EPQ.4 pieces in lot. An impressive grouping with P-207a, 208d & 209c all in PMG Superb Gem Uncirculated 67 EPQ and also all showing the same serial number of 000038. P-215d in PCGS GSG 66 OPQ with a 262626 repeater serial number.